If you've been a zombie for a while, you're lucky if you've been able to retain all of your limbs. There are just so many ways to lose an arm or a leg…or even your hands when you're foraging around looking for brains to eat. These Kids Rotten Flesh Hands look like they’ve been through the ringer…but hey, it’s better than having no hands at all. 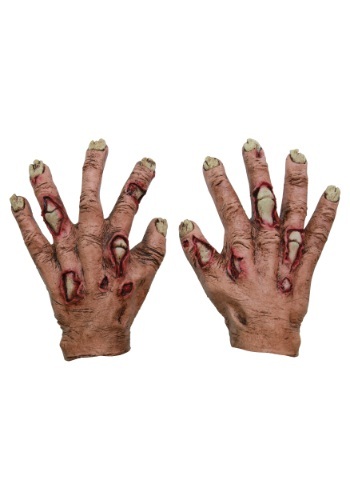 Actually, these Rotten Flesh Hands represent a pretty realistic interpretation of what a zombie’s hands would look like. The nails are jagged and bits and pieces of flesh are missing, like you’ve been clawing and grabbing for your next tasty morsel. You would never be able to replicate the effect unless you were a zombie. An added benefit is that you can keep your pristine hands covered with these rotten flesh hand covers. No one has to know you’re really not a zombie. They will totally match the look of your decaying flesh costume while keeping your real digits covered and concealed! And by the way…your secret is safe with us.